For some it might be Kraftwerk, but for me, my favourite electronic pioneers are probably Australia’s Severed Heads. They were so far ahead of the game that they had to invent a lot of the technology they used. Inspired, playful, never boring and always sonically brilliant they pushed at the frontiers of electronic music more than most. By the late 80s they were pursuing a slightly more polished course and made a series of records that had the potential to reach a much larger audience. Possibly because of their name they never quite managed that, but they had several big club hits; the dub versions of which crossed over into the nascent house scene. I am honoured that I am able to make the dubs of those three 12″s from 1988 – 1990 available again. On side A is “Greater Reward (Dub)” which has possibly thee most beautiful piano in the history of dance music. Often sampled but never equalled, it still brings joy to dancefloors 27 years after it was released. 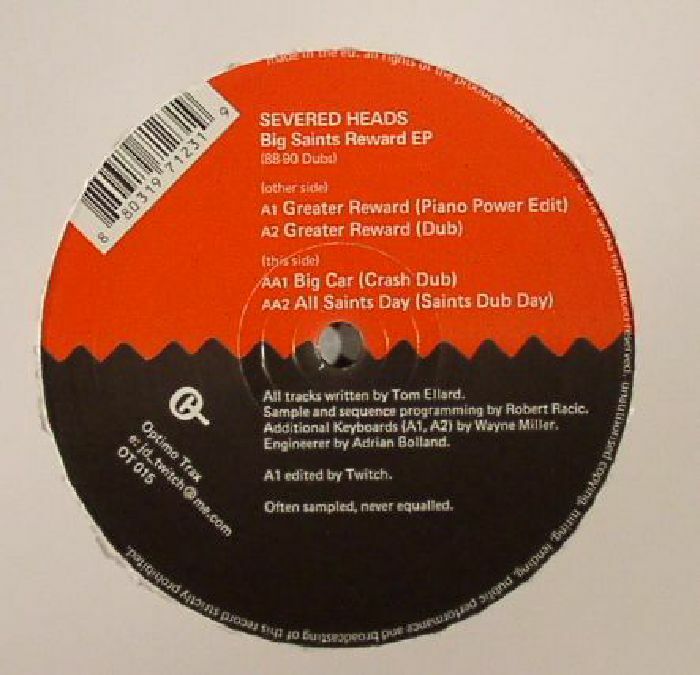 Severed Heads original production and mastering was so ahead of the game that it needed only the slightest re-master. The original, while perfect in every way was always tricky to dj with as THAT piano was right at the start so if it was mixed in, it wouldn’t get heard until much later in the track. I’ve slightly rearranged it for dj use but haven’t added anything whatsoever. Side A also includes the majestic original. On the AA side. “Big Car (Crash Dub)” is a masterclass in how to make a track that chugs that is tedium free. At the time it had possibly the heaviest kick drum I’d ever heard and was akin to a mutant cousin of one of David Morales legendary Red Zone house dubs. “All Saints Day (Saints Day Dub)” rounds off the EP with future looking sound design, hypno bass and trademark Severed Heads edit magic. Optimo Trax OT 015 is released on 12″ and digital, May 18th. Distribution by Kompakt and Rub A Dub.